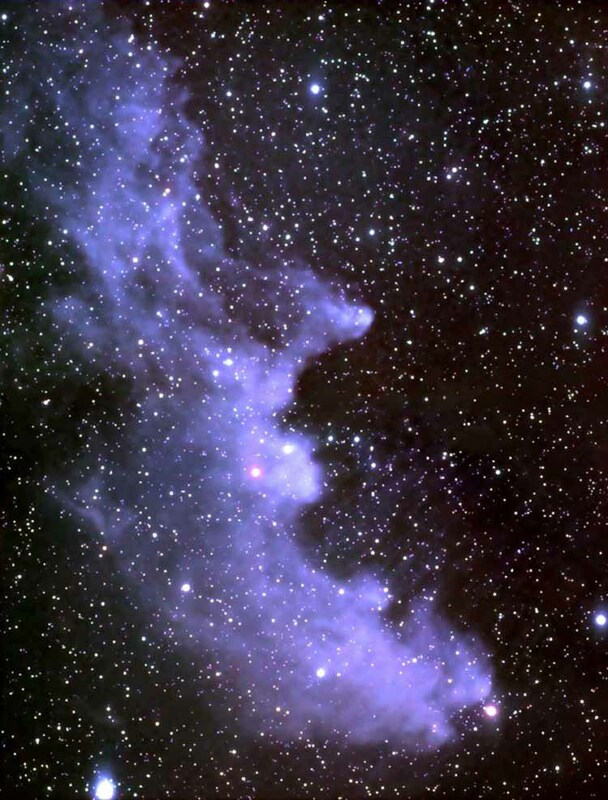 The constellations best seen in December are Aries, Eridanus, Fornax, Horologium, Perseus and Triangulum. Perseus, Triangulum and Aries are located in the northern sky, while Eridanus, Fornax and Horologium are southern constellations. 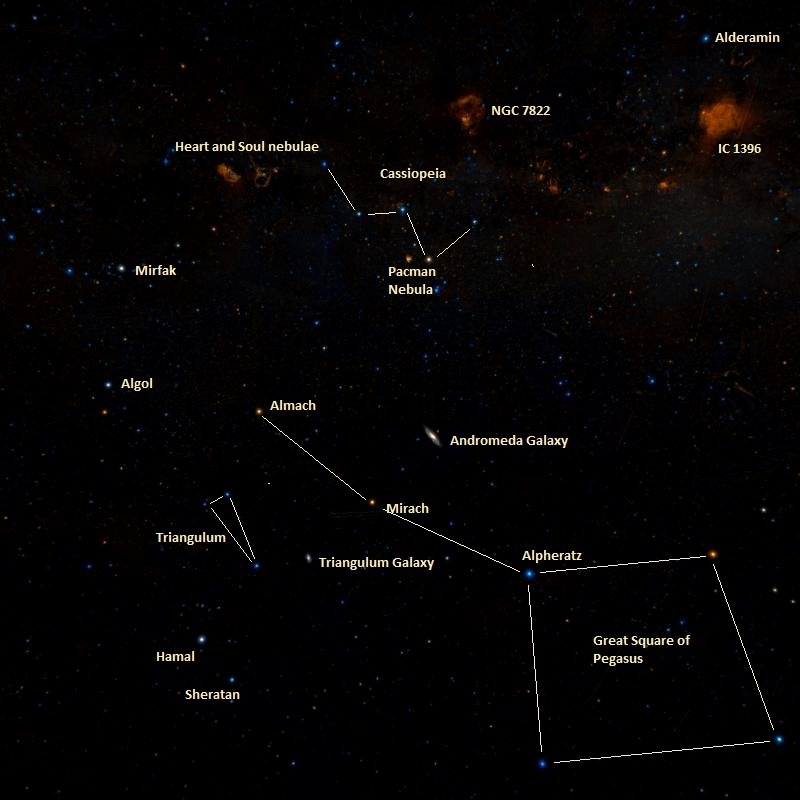 December is the best time of year to observe several well-known deep sky objects that are located in these constellations. They include the Triangulum Galaxy (M33), the Alpha Persei Cluster, the Little Dumbbell Nebula (M76), the Double Cluster (NGC 869 and NGC 884), the California Nebula (NGC 1499), and the Fornax Cluster of galaxies. Perseus is among the larger constellations, 24th in size, occupying an area of 615 square degrees. Stargazers know it mainly for its association with the annual Perseid meteor shower, which occurs in mid-August. The constellation is fairly bright, with five stars brighter than magnitude 3.00, and easy to find because it is located between Auriga’s recognizable pentagon pattern, Cassiopeia’s W, the bright Pleiades cluster in Taurus, and Andromeda’s chain of three bright stars that ends with the Great Square of Pegasus. The brightest star in the constellation is Mirfak, Alpha Persei, an F-class supergiant with an apparent magnitude of 1.8. Mirfak is the brightest member of the Alpha Persei Cluster (Melotte 20), an open cluster with a visual magnitude of 1.2. The most famous star in Perseus is Algol, Beta Persei, a triple star composed of a binary pair and a more distant third component. The binary system consists of a luminous B-class main sequence star and an orange subgiant. It serves as a prototype for a class of eclipsing variables known as the Algol variables. Algol usually has an apparent magnitude of 2.1, but it dims to magnitude 3.4 every 2.86 days, when the fainter secondary component passes in front of the primary star. Perseus contains several famous deep sky objects. These include the bright open cluster Messier 34 (mag. 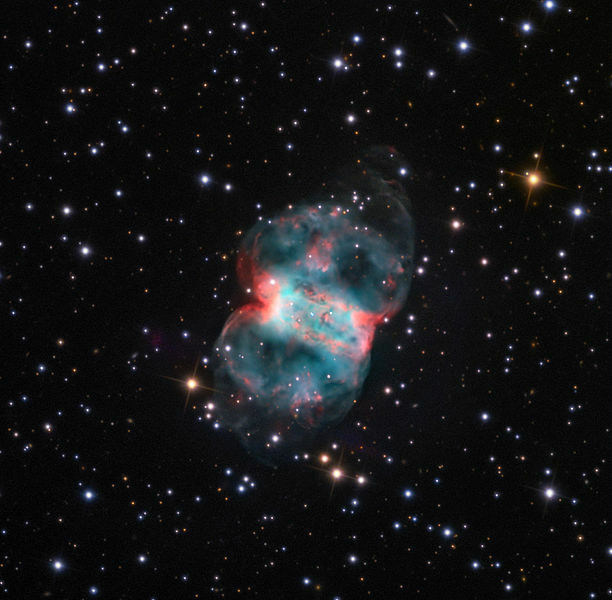 5.5), located near Algol, the planetary nebula Messier 76 (mag. 10.1), better known as the Little Dumbbell Nebula, which lies near Alseiph, Phi Persei, and not far from the Andromeda Galaxy (M31), the Double Cluster (NGC 869 and NGC 884), a pair of bright (mag. 3.7 and 3.8) neighbouring open clusters near the Heart and Soul nebulae in Cassiopeia, the California Nebula (NGC 1499), an emission nebula with a visual magnitude of 6.0, and NGC 1333, a reflection nebula with a magnitude of 5.6. Perseus is also home to the Perseus Cluster of galaxies (Abell 426), one of the most massive objects discovered. The Seyfert galaxy NGC 1275, named Perseus A, lies near the center of the cluster. The galaxy NGC 1260, another cluster member, hosted the second brightest supernova ever recorded, SN 2006gy, in September 2006. Triangulum is one of the smallest constellations in the sky, 78th in size, with an area of only 132 square degrees. None of its brightest stars, which form an elongated triangle, are brighter than magnitude 3.00, but the triangle asterism and the proximity to the brighter Andromeda and Aries make the constellation easy to find on a clear night. 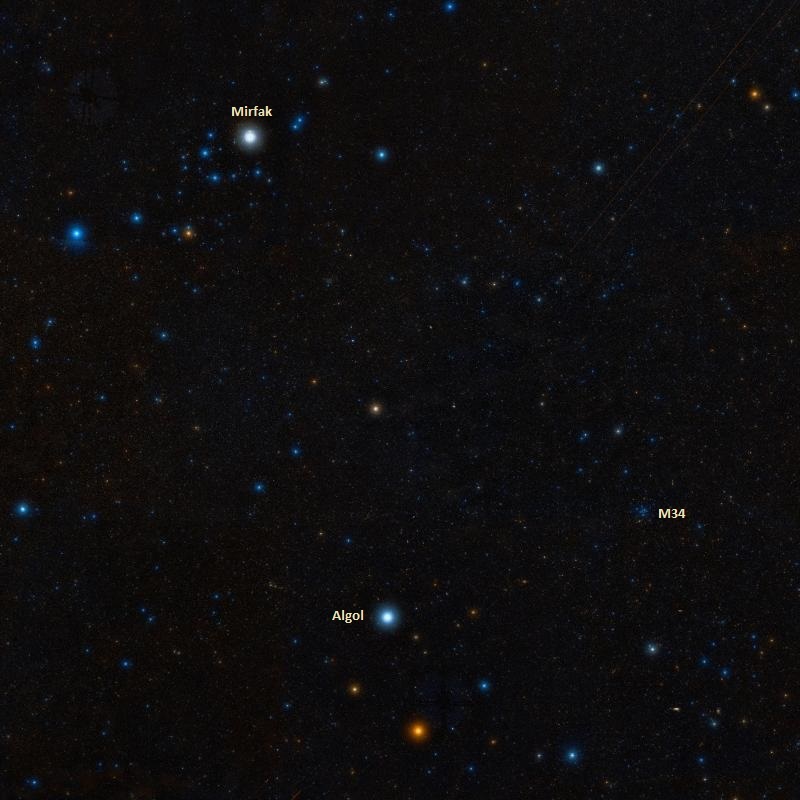 The brightest stars in Triangulum are Deltotum (Beta Trianguli), a class A subgiant star with a spectroscopic companion and an apparent magnitude of 3.00, Mothallah (Alpha Trianguli), a magnitude 3.42 F-class subgiant or giant, also in a spectroscopic binary system, and Gamma Trianguli, a white main sequence star with a magnitude of 4.03. Beta and Gamma Trianguli mark the base of the triangle and Alpha Trianguli, the apex. 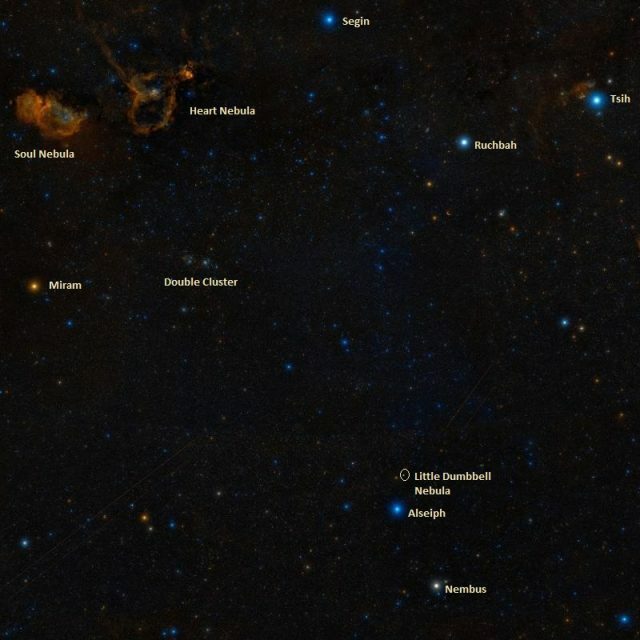 Triangulum contains several notable deep sky objects. 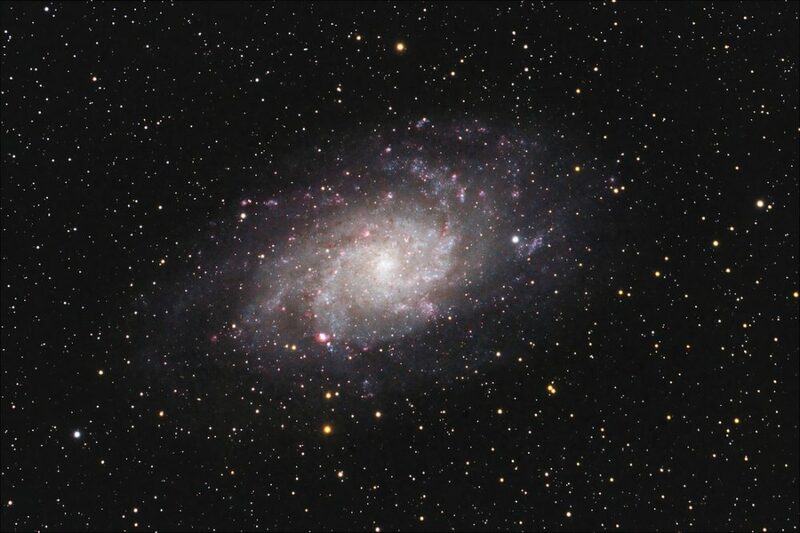 The best known of these is the Triangulum Galaxy (Messier 33), the third largest galaxy in the Local Group and one of the most distant objects visible to the naked eye. M33 is a spiral galaxy with an apparent magnitude of 5.72. It is considerably fainter and more diffuse than its larger neighbour, the Andromeda Galaxy, and requires exceptionally good conditions to be seen. The Triangulum Galaxy lies outside the triangle asterism, near the border with Pisces. The easiest way to find it is using Mirach, the middle star in the chain of three bright stars of Andromeda that stretches from the Great Square of Pegasus to Perseus. The galaxy is located between Mirach and the bright stars Hamal and Sheratan in Aries constellation. The Triangulum Galaxy hosts NGC 604, one of the largest H II regions known, and several other emission nebulae, including NGC 588, NGC 592 and NGC 595. Other galaxies in Triangulum include the spiral galaxies NGC 634, NGC 784 and NGC 925, and the interacting pair NGC 672 and IC 1727. Aries, the Ram, occupies an area of 441 square degrees and, with only two stars brighter than magnitude 3.00, it is not a particularly bright constellation. 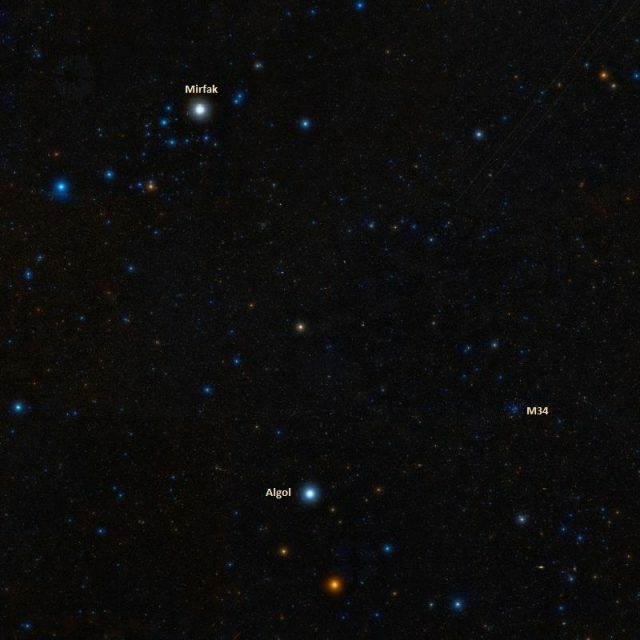 Hamal, Alpha Arietis, is the brightest star in Aries and the 49th brightest star in the sky. It is an orange giant with an apparent magnitude of 2.00, which makes it about as bright as Polaris, the North Star. Sheratan, Beta Arietis, is a spectroscopic binary star system with a visual magnitude of 2.65. The brighter component in the system is a white main sequence star. Aries is home to several notable galaxies. These include NGC 772, an unbarred spiral galaxy with an apparent magnitude of 11.1, surrounded by several satellite galaxies, the interacting pair NGC 935 and IC 1801, the intermediate spiral galaxy NGC 877, the brightest member of the NGC 877 Group, NGC 691, another unbarred spiral galaxy (mag. 11.5) and the most prominent member of the NGC 691 Group, which also includes the pair NGC 680 and NGC 678, and the spiral galaxy NGC 694. Eridanus, the celestial river, is the sixth largest constellation in the sky, with an area of 1138 square degrees. It is mostly invisible to observers north of latitude 32°N. The brightest star in the constellation is Achernar, Alpha Eridani, a B-class white main sequence star with a luminosity more than 3,000 times that of the Sun. It is the hottest, bluest of the 10 brightest stars in the sky. It has a companion, a white main sequence star, in close orbit. Eridanus is also home to Epsilon Eridani, the third nearest star to Earth that is visible to the naked eye, after Alpha Centauri and Sirius, and the 13th nearest star overall. Also known by the proper name Ran, the star lies at a distance of only 10.5 light years. It is an orange main sequence star with a visual magnitude of 3.736. It is located in the northern part of the constellation, roughly between the bright stars Rigel in Orion and Mira in Cetus, and unlike Achernar, it can be seen from most places on Earth. 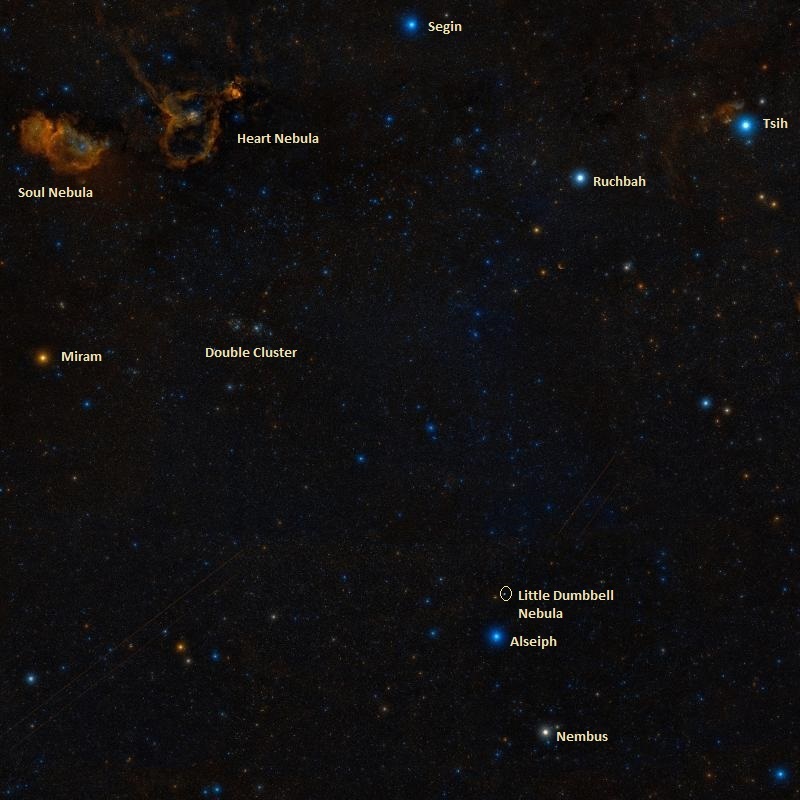 Eridanus contains a number of notable deep sky objects. These include Cleopatra’s Eye Nebula (NGC 1535), a magnitude 10.5 planetary nebula similar to the Eskimo Nebula in Gemini, the Witch Head Nebula (IC 2118), a magnitude 13 reflection nebula illuminated by the bright supergiant Rigel in Orion, the ring galaxy NGC 1291 with an apparent magnitude of 9.39, the Eridanus Cloud (Eridanus Group), a group of about 200 galaxies, the brightest of which is the elliptical galaxy NGC 1407 with a magnitude of 9.7, and the Eridanus Cluster of galaxies, which contains the relatively bright spiral galaxies NGC 1300 (mag. 11.4) and NGC 1232 (mag. 10.9), and about 200 other members. Surrounded by Eridanus on three sides, the constellation Fornax is quite faint, with only one star brighter than magnitude 4.00. The brightest star, Alpha Fornacis, also known as Dalim, is a binary system with an apparent magnitude of 3.85. 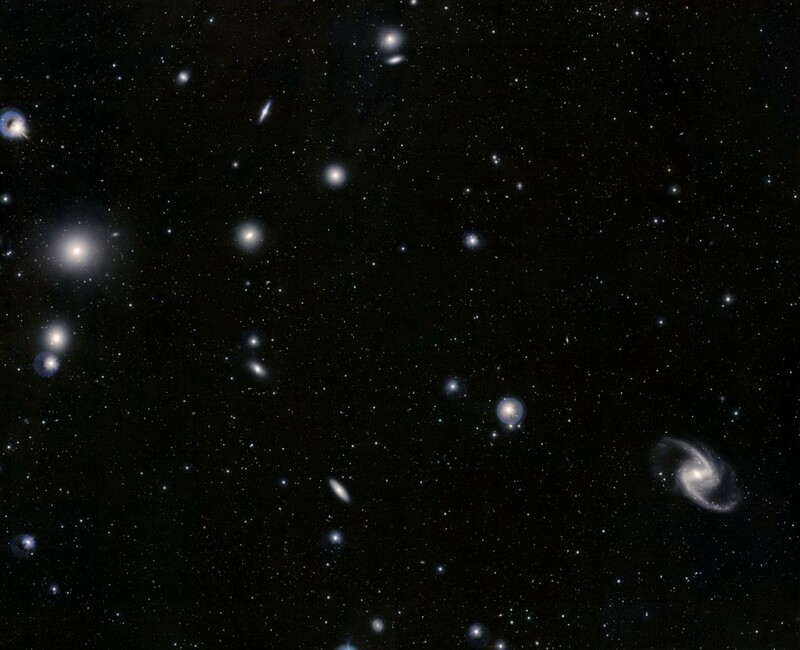 Fornax is home to the Fornax Cluster of galaxies, the second richest cluster within 100 million light years. Notable members of the cluster include the radio galaxy Fornax A (NGC 1316), a lenticular galaxy with an apparent magnitude of 9.4 and the fourth brightest radio source in the sky, the elliptical galaxy NGC 1399 (mag. 9.9), the central galaxy in the cluster, the Great Barred Spiral Galaxy (NGC 1365), with a visual magnitude of 10.3, the irregular galaxy NGC 1427A (mag. 13.4), and the elliptical galaxy NGC 1404 (mag. 10.3). Fornax A is the brightest galaxy in the cluster. 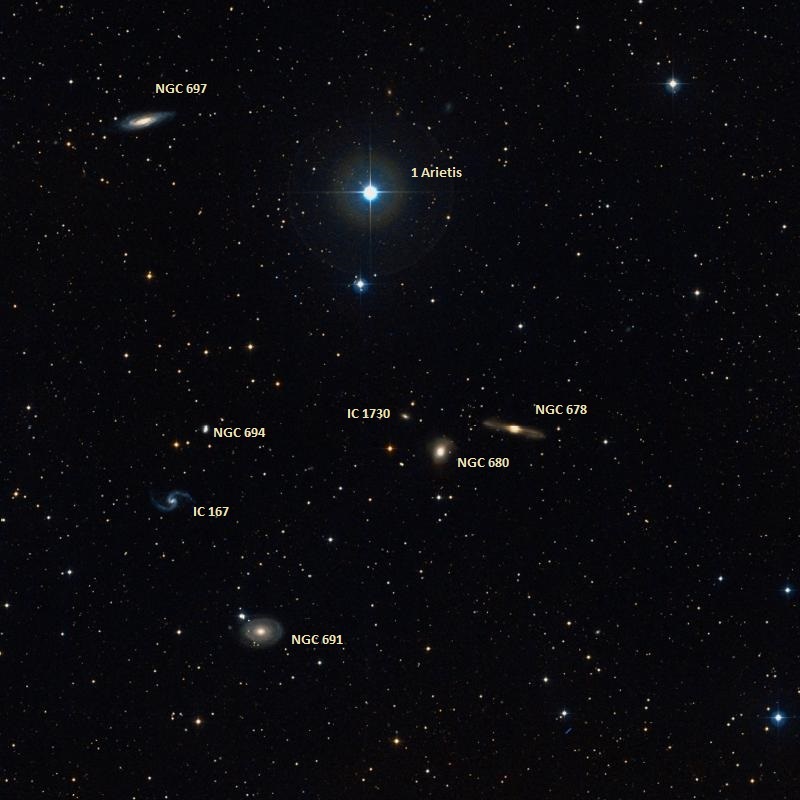 Other interesting deep sky objects in Fornax include the Fornax Dwarf, a dwarf galaxy in the Local Group, the Robin’s Egg Nebula (NGC 1360), a planetary nebula with a visual magnitude of 9.4, and the barred spiral galaxy NGC 1097, a Seyfert galaxy interacting with the companion galaxy NGC 1097A. Horologium is the southernmost of the December constellations. It is quite faint, with no stars brighter than magnitude 3.00. Its brightest star, the orange giant Alpha Horologii, has an apparent magnitude of 3.853, and other stars are fainter than magnitude 4.7. 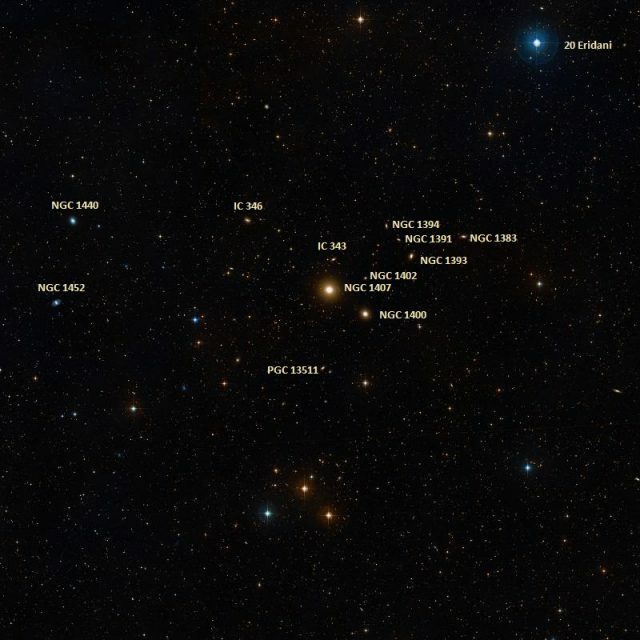 The red giant R Horologii, the constellation’s second brightest star, is a Mira variable with one of the largest ranges in luminosity ever discovered. The star’s brightness varies from magnitude 4.7 to 14.3. 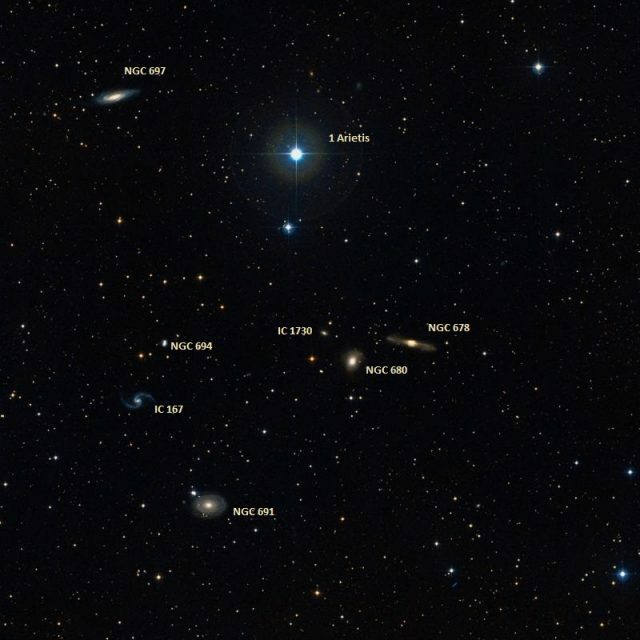 Horologium contains the Horologium Supercluster, a massive galaxy supercluster that contains about 5,000 groups of galaxies located in Horologium and the neighbouring Eridanus. These include Abell 3266, one of the largest clusters of galaxies in the southern celestial hemisphere. Other notable deep sky objects in Horologium are the magnitude 8.3 globular cluster NGC 1261, the barred spiral galaxy NGC 1512 (mag. 11.1), a member of the Dorado Group of galaxies and interacting with the companion dwarf lenticular galaxy NGC 1510, and Arp-Madore 1, one of the most distant globular clusters known, located at a distance of 398,000 light years. NGC 1512, image: NASA, D. Maoz (Tel-Aviv University, Columbia University), A. J. Barth (Harvard CfA), L. C. Ho (Carnegie Obs. ), A. Sternberg (Tel-Aviv University and A. V. Filippenko (UC Berkeley).